Cymbidium orchids, also known as Boat Orchids, are very showy! They have sprays with 1-2 dozen large, colorful flowers. Some of these are fragrant orchids. Numerous colors are available; there are very nice reds, pinks, greens, and yellows. (Other colors are available too; those are just the ones that stand out to me.) They originate in parts of Asia, including China, Japan, India, the Phillipines, and other countries; they range fairly widely, and have been cultivated for a long time. There is evidence that they were grown in China thousands of years ago. Many of the larger-flowered species grow at high altitudes in nature, particularly in the foothills of the Himalayas. These sympodial orchids have dense pseudobulbs, with narrow leaves produced above; the foliage can be quite attractive, and some plants have variegated leaves. Cym. grandiflorum, a very nice green Cymbidium orchid. 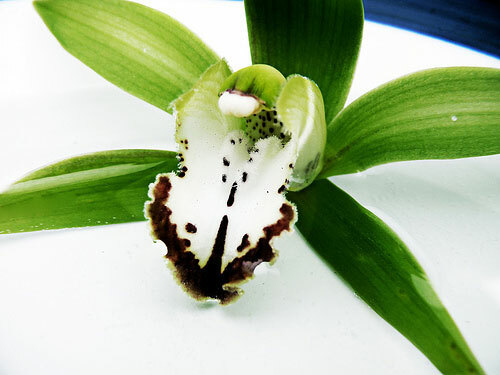 Cymbidiums need cool temperatures to initiate blooming; in a temperate climate, leave them outside in fall until temperatures have gotten down to 55°F (13C) or lower. Actually, it's best if you let the temperatures get into the 30's Fahrenheit (0-4C). They can survive below freezing for short durations. Timing when to bring them indoors in climates with a cold winter can be a challenge. When not trying to make them start blooming, provide intermediate temperatures, 65°-75°F (19-24C) during the day with a nighttime drop of 10-15°F (6-8C). Provide bright indirect lighting, 3,000-5,000 footcandles, similar to what you'd use for a Cattleya orchid. Water often to keep the growing medium moist, especially while the plant is actively growing. A good potting mix will stay moist but drain thoroughly enough that none of the roots are sitting in water. Don't repot before the medium has broken down, as Cymbidiums have extensive root systems that have to be disturbed a lot in repotting. (And you have to be fairly aggressive in cutting them apart to divide a plant.) They like to be a bit underpotted, so don't worry if it's crowding the edges of the pot a bit.